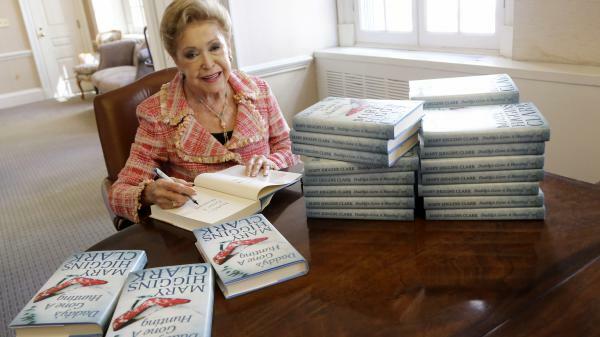 Author Mary Higgins Clark signs copies of her book Daddy's Gone A Hunting at the Simon and Schuster office in New York in 2013. At a recent pre-birthday party hosted by her publishing company, Simon and Schuster, Higgins Clark slowly made her way through the crowd. Elegantly dressed with perfectly coiffed hair and beautifully manicured nails, she supported herself with a cane that looks like it's made of crystal. Michael Korda, her longtime editor, said, "I always refer to this as 'Mary's magic wand.' "
The two have an easy rapport, which was obvious as they sat down to talk in a quiet corner of the room. Higgins Clark said they've worked together since 1974. "Mary's been counting," Korda said. "I haven't. But that sounds right." As the two bantered back and forth, Higgins Clark revealed her self-deprecating sense of humor with a story about a run-in with a would-be fan. "We go to Palm Beach for a couple of weeks in February, and I was walking down North Avenue and a woman came: 'I can't believe I'm seeing you. I can't believe I'm in your presence. I'm awed to think that I am standing next to — Danielle Steel.' " Higgins Clark and Korda have a good laugh at the idea that she's been confused with another best-selling author. According to Korda, Higgins Clark usually finishes one novel around this time of year, and that's when they begin plotting the next one. "I start phoning up Mary and saying, 'How about this? How about that?' And Mary is wonderful because she says, 'Well, if that were it, I could do this, and this would happen and that would happen,' and she begins to fill it in. Or she says, which is very often the case, 'No, that's not going to work for me.' "
Both agreed that Higgins Clark's popularity is rooted in her ability to keep her readers turning pages compulsively. Higgins Clark said, "That is the greatest compliment I can get, when someone will say to me, 'I read your darn book till 4 in the morning.' I say, 'Then you got your money's worth.' "
"Any novel that doesn't deliver that is lacking in something," Korda said. "And Mary has that — she has that instinct to a degree which is very, very rare." Storytelling may be instinctive for Mary Higgins Clark, but she's also famous for her work ethic, which she honed as a young girl growing up in the Bronx, a borough of New York City. Her father died suddenly, leaving her mother to raise three children on very little money. Higgins Clark was 15 when she started going in to Manhattan to work as a telephone operator. When her own husband died suddenly, Higgins Clark had five children to support. She took a job writing short radio programs and got up at 5 a.m. every day to work on her own writing. "I could work without interruption till quarter of 7 and then get the kids breakfast," Higgins said. "And I was picked up by my carpool at quarter of 8, and the guys said it was indecent to look in the back seat of the car — I was still half dressed, in curlers and dragging stockings on." Initially, she sold some short stories and a book about George Washington, but it was her first suspense novel, Where are the Children?, that really took off. Simon and Schuster had given her a $3,000 advance on the first book, and they offered a great deal more for the next. Clark remembers the day her agent called with the news. "She said, 'Simon and Schuster has offered $1 million for the hardcover, and Dell is offering $500,000 for the paperback.' And she said, 'Think about it.' I said, 'Think about it!? God's sake, call them back!' "
Some 50 books later, Higgins Clark is still with Simon and Schuster. At her 90th birthday party, the publisher's president, Carolyn Reidy, toasted Higgins Clark as "the first lady" of Simon and Schuster, noting that all her books have been best-sellers. Alafair Burke was among the guests paying homage to Higgins Clark. She co-authors one of the two books Higgins Clark publishes every year. (Their latest is Every Breath You Take.) Burke has been reading Higgins Clark since high school and said she can't believe she's actually working with her now. "There's no diva in her whatsoever," she said. "It's equal work. We sit there and she listens to me; I listen to her. She treats me as a peer. It's really incredible." Bob Barnett — the Washington, D.C., lawyer who brokers some of the biggest deals in the book business — represents Higgins Clark. He said she is publishing royalty, and he sees no end in sight for her writing career. "When you're 90, and you sign a new two-book deal, that's pretty remarkable," he said. "And I see no possibility that we won't do five, six, seven more two-book deals." But 90 seems a lot older than 89, Higgins Clark said, and she's not at all sure she wants to make it to 100. She does know one thing: No matter how many years she has left, she plans to spend them writing. After all, she said, it's the only thing she's good at. "If the fairy godmothers come to the cradle, the one who might have left me a singing voice was out of town. I can't sew anything. Well, I fed five kids, but I'm no gourmet cook." She just turned in a book that's due next spring. Pretty soon no doubt, once the celebrations die down, she and Michael Korda will be throwing around ideas for her next release. Mary Higgins Clark has made a good living off murder. She creates characters that readers can identify with and then puts them in scary situations in her novels. Readers love her work enough to have bought 100 million copies of her stories in the United States alone. Some readers can identify with her own remarkable story. Mary Higgins Clark did not get a book published until she was a widow in her 40s - never too late. She still turns out two books a year. NPR's Lynn Neary profiles a writer whose birthday comes on Christmas Eve. LYNN NEARY, BYLINE: Mary Higgins Clark is celebrating her 90th birthday in style. At a pre-birthday party hosted by her publishing company, Simon & Schuster, Higgins Clark slowly made her way through the crowd. UNIDENTIFIED MAN #1: Happy birthday. MARY HIGGINS CLARK: Oh, thank you so much. UNIDENTIFIED MAN #1: Happy early birthday. NEARY: Elegantly dressed with perfectly coiffed hair and beautifully manicured nails, she supported herself with a cane that looked like it was made of crystal. MICHAEL KORDA: I always refer to this as Mary's magic wand. NEARY: Michael Korda is Higgins Clark's longtime editor. The two have an easy rapport, which was obvious as they sat down to talk in a quiet corner of the room. How long have you two worked together? KORDA: Mary's been counting. I haven't. But that sounds right. NEARY: As the two banter back and forth, Higgins Clark reveals her self-deprecating sense of humor with a story about a run-in with a would-be fan. HIGGINS CLARK: We go to Palm Beach for a couple of weeks in February. And I was walking down Worth Avenue, and a woman came. I can't believe I'm seeing you. I can't believe I'm in your presence. I'm awed to think that I am standing next to Danielle Steele. NEARY: Korda says Higgins Clark usually finishes one novel around this time of year. And that's when the two begin plotting her next one. HIGGINS CLARK: How about (laughter). KORDA: ...How about this, how about that? And she - Mary's wonderful 'cause she says if that were it, I could do this and this would happen and that would happen. And she begins to fill it in. Or she says - which is very often the case - no, that's not going to work for me. HIGGINS CLARK: My one virtue was to be an Irish storyteller. NEARY: Both agree that Higgins Clark's popularity is rooted in her ability to keep her readers turning pages compulsively. KORDA: The critical factor is that each chapter should bring you to the point where, whatever time of the night it is, you want to turn the next chapter. And - yeah. HIGGINS CLARK: That is the greatest compliment I can get, when someone will say to me - I read your darn book till 4 in the morning (laughter). HIGGINS CLARK: I say, then you got your money's worth. KORDA: Yeah, absolutely. And any novel that doesn't deliver that is lacking in something. And Mary has that. She has that instinct to a degree which is very, very rare. NEARY: Storytelling may be instinctive for Mary Higgins Clark, but she's also famous for her work ethic, which she honed as a young girl growing up in the Bronx. Her father died suddenly, leaving her mother to raise three children on very little money. Higgins Clark was 15 when she started going into Manhattan to work as a telephone operator. HIGGINS CLARK: Hotel Shelton - good afternoon. You know those old switchboards? So I was doing that three afternoons a week after school. NEARY: When her own husband died suddenly, Higgins Clark had five children to support. She took a job writing short radio programs and got up at 5 o'clock every morning to work on her own writing. HIGGINS CLARK: And I could work without interruption till quarter of 7 and then get the kids breakfast. And I was picked up by my carpool at quarter of 8. And the guys said it was indecent to look in the backseat of the car (laughter). I was still half-dressed, in curlers and dragging stockings on. NEARY: She sold some short stories and a book about George Washington. But it was her first suspense novel, "Where Are The Children?" that really took off. Simon & Schuster, which had given her a $3,000 advance on the first book, offered her a great deal more for the next one. Clark remembers the day her agent called her with the news. HIGGINS CLARK: She says, Mary, are you sitting? And I said yes. She said Simon & Schuster has offered $1 million for the hardcover. And Dell is offering $500,000 for the paperback. And she said, think about it. I said - think about it? God's sake, call them back (laughter). NEARY: Some 50 books later, Higgins Clark is still with Simon & Schuster. At her 90th birthday party, company president Carolyn Reidy, noting that all her books have been best-sellers, toasted Higgins Clark as the first lady of Simon & Schuster. CAROLYN REIDY: We could not be happier than to be here tonight, Mary, to celebrate your birthday. And I ask you all to raise a toast with me to Mary. UNIDENTIFIED MAN #2: Hear, hear. UNIDENTIFIED PEOPLE: Hear, hear. Cheers. NEARY: Among the guest paying homage to Higgins Clark was Alafair Burke, who co-authors one of the two books Higgins Clark publishes each year. Their latest is "Every Breath You Take." Burke has been reading Higgins Clark since high school and can't believe she's actually working with her now. ALAFAIR BURKE: There's no diva in her whatsoever. It's equal work. We sit there. And she listens to me. I listen to her. She treats me as a peer. It's really incredible. NEARY: Bob Barnett, the Washington, D.C., lawyer who brokers some of the biggest deals in the book business, represents Higgins Clark. He says she is publishing royalty. And he sees no end in sight for her writing career. BOB BARNETT: And when you're 90 and you sign a new two-book deal, that's pretty remarkable. And I see no possibility that we won't do five, six, seven more two-book deals. UNIDENTIFIED PEOPLE: (Singing) Happy birthday, dear Mary. Happy birthday to you. HIGGINS CLARK: Oh, my goodness. NEARY: Somehow, Higgins Clark says, 90 seems a lot older than 89. And she's not at all sure she wants to make it to 100. But she does know one thing. No matter how many years she has left, she plans to spend them writing. After all, she says, it's the only thing she's good at. HIGGINS CLARK: I say if the fairy godmothers come to the cradle, the one who might have left me a singing voice was out of town. I can't sew anything. Well, I've fed five kids, but I'm no gourmet cook. HIGGINS CLARK: Honestly not - just turned in the April one, so I don't have to write at the moment. And I'm thinking, what'll I do? NEARY: Pretty soon, no doubt - once the celebrations die down - she and Michael Korda will be throwing around some ideas for her next book. (SOUNDBITE OF BLOCKHEAD'S "UNSTUCK - INSTRUMENTAL") Transcript provided by NPR, Copyright NPR.